I have a very good friend, Andrea, who lives and blogs over ate Maybe It's Just Me. Although we live hundreds of miles apart, I feel as though we live next door to each other. We share a fondness for Legos, likely brought to the surface by our male progeny. We are particularly fond of the mini-figures, which are just plain cute. I just love them all. I know--weird, huh? I don't care. I embraced my nerdiness years ago! As we were waiting in anticipation for the opening of The Lego Movie, I mentioned that I had not been able to find any of the movie mini-figures anywhere. Toys R' Us, Walmart, Target...it was no use crying about it. The "collectors" had cleaned them out. But I did get a bit verklempt when I mentioned it to Andrea. Well, as tearful as one can get via text and emoticons. Google can only do so much. So it was with great happiness that I found a package in my mailbox this weekend. Larry and Zane were sad, because they didn't get any package in the mail. 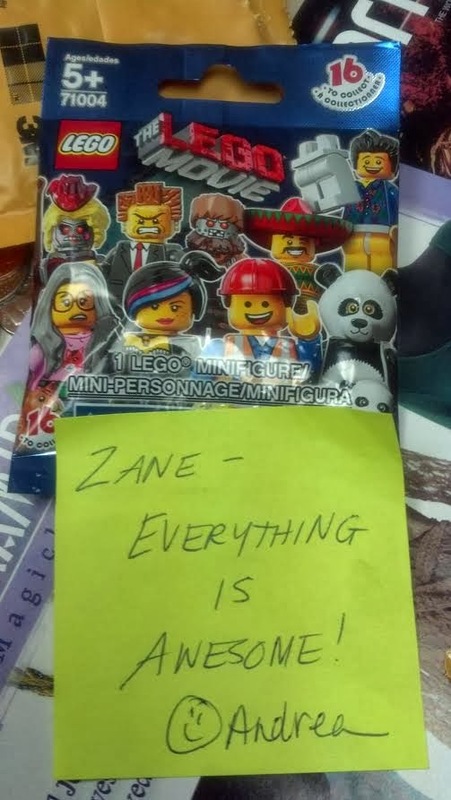 But when I opened the envelope, out popped three Lego mini-figures, each one with a note on it. You would have thought it was Christmas all over again. Larry and Zane practically bowled me over grabbing their mini-figures, and the next few minutes were spent opening the packages and putting together the figures. And indeed, everything was awesome! Zane got Emmett, the star of The Lego Movie, I got Wild Style, and Larry got Larry the Barrista(which was funnier because my Larry drinks tons of coffee)! It was a perfect little family bonding moment, each of us with our mini-figures, reciting lines from the movie. Then we had to go find Batman and Superman, and build a space ship so that we could fly over what's left of Helms Deep and look for Bigfoot. Good clean fun. But in this darkest part of winter, when the blahs are rampant, it is nice to open a package of sunshine. Thank you! I seriously thought of you the whole time we were at the movie. Legos are not "my thing" but the movie was so good (and thought provoking too). 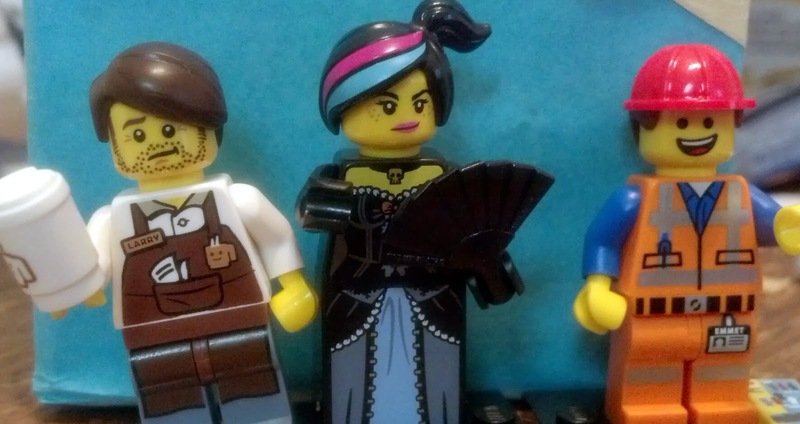 I love that your friend sent you those Lego persons, I love when a small thing like that makes a whole day and I not only like when it happens to me by someone sending me a little sunshine, but also when I can do it for others...I like SENDING the sunshine too. this post made me smile, YAY FRIENDSHIP! Yay! And you're welcome. I am so glad the trio was welcomed in by superheroes (of the human and plastic kind) for their next great adventure!